Pine Tree Farms has been manufacturing quality wild bird feeding products since 1984. 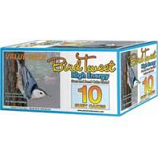 Birdwatchers Best Berry Essence Suet. 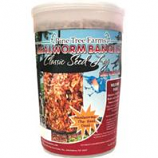 Birdwatchers Best Orange Essence Suet. 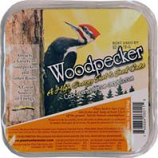 Birdwatchers Best Superior Blend Suet. Value and quality in one cake. Attracts a variety of birds. A great source of energy. A quality product for year-round feeding. . Attracts a variety of woodpeckers and other birds.. Great source of energy. Place seed and seed cake into feeder and hang at least 5 feet off the ground. Not for human consumption. . Attracts a variety of birds. A great source of energy. . . .
• Attracts A Variety Of Birds and Is A Great Source Of Energy. • Place Suet Seed Cake Into Feeder and Hang At Least 5 Feet Off The Ground. • Wild Bird Food, Feed Year Round. • Place Seed Cake Into Feeder and Hang At Least 5 Feet Off The Ground. • Place Suet Seed Cake Into Feeder and Hang At Least 5 Feet Off Ground. • Vitamin and Mineral Fortified. • No Melt No Mess. Will Not Soften Or Crumble. • Place Finch Cake Into Feeder and Hang At Least 5 Feet Off The Ground. • High Quality Mixture Of Nuts, Almonds, Sunflower Seed and Corn, Striped Sunflower Seed, Black Sunflower Seed. • This Blend Provides Squirrels Or Other Wildlife With A High Energy Level and Complete Nutritional Diet. • Consist Of The Finest Seeds & Nuts To Attract A Variety Of Birds. • Provides A Great Source Of Energy For Year Round Feeding. • Place Suet Cake Into Feeder and Hang At Least 5 Feet Off Ground. • Attracts A Variety Of Birds and Is A Great Source Or Energy. • Place Cake Into Feeder and Hang At Least 5 Feet Off Ground. • The Finest Seeds & Nuts To Attract A Variety Of Birds. • A Great Source Of Energy For Year Round Feeding. • A Mix Of Tree Nuts and Fruit To Attract A Variety Of Birds. • No Hulls, Less Mess. • Refills For Log Feeders. 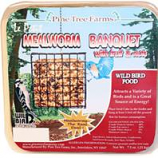 • Wild Bird Food To Feed Year Round. • Fill Your Log Jammer Bird Feeder With These Specially Made Plugs Of Suet. • No Hulls, Less Mess..
• The Wild Bird Suet Is Packaged For Convenience. • Place Suet Cake Into Feeder and Hang At Least 5 Feet Off The Ground. • It Is Refined To Maintain A High Melting Point For Year Round Feeding.